WHEN Mark Zuckerberg was a 19-year-old he had a conversation with a friend he must surely regret today. Talking over an online instant messenger service on their Harvard campus, Zuckerberg expressed disbelief at the fact other students were handing over their personal information to be a part of the campus-wide social media site he had created. Fourteen years later, his words are coming back to bite him. Here's what he said. Zuckerberg: Yeah so if you ever need info about anyone at Harvard ... Just ask. Friend: What? How'd you manage that one? Zuckerberg: I don't know why. To be fair, he could've been joking or showing off to his mate and this was many years before Facebook turned into the social media juggernaut it is today with 2.2 billion users and an imperative to behave ethically. But it also shows that perhaps the Facebook founder was always relatively unconcerned about the privacy rights of his users. At least from very early on he understood the power of owning their personal information. The company has routinely come under fire for how it uses people's data, and who it shares it with. But the latest scandal involving a shadowy company that pinched Facebook user data to help it design software to influence elections has given the company its biggest black eye yet. British data analysis firm Cambridge Analytica has been accused of harvesting the data of some 50 million Facebook users' profiles without their knowledge to help it design software to predict and influence voters' choices at the ballot box. The firm, which is owned by hedge fund billionaire Robert Mercer, says it can analyse consumer data - including social media and its own polling - in order to target people with marketing material. The company's antics were reportedly used, and believed to have been highly effective, in the election of Donald Trump and the successful Brexit vote. The inner workings of the company were revealed this week by Christopher Wylie, a Canadian data analytics specialist and whistleblower who created the company's system but has now spoken out against it. "We exploited Facebook to harvest millions of people's profiles. And built models to exploit what we knew about them and target their inner demons," he told London's Observer. SO WHAT ROLE DID FACEBOOK PLAY? Facebook was not directly involved in Cambridge Analytica's shadowy games of influence but its lax approach to user privacy made it possible. A majority of reports this week referred to the firm's dubious use of Facebook user data as a "data breach" but while it was against the company's rules, that moniker is hardly accurate. In 2014 researcher Dr Aleksandr Kogan created an app that asked users to take a personality test for academic research purposes. About 270,000 people agreed but due to Facebook's terms of service the app was also able to collect data of their friends. This gave the Dr Kogan the raw information of more than 50 million people, which he later handed to Cambridge Analytica. It's not exactly what Facebook wanted but a scenario it eagerly helped create and did little to prevent, despite the company's assurances that "protecting people's information is at the heart of everything we do." In a since deleted tweet, Facebook's chief security officer Alex Stamos wrote: "It is incorrect to call this a 'breach' under any reasonable definition of the term." It was not a breach or a hack but rather an inevitable outcome of what's become known as surveillance capitalism - the term used to describe the data-hungry business model of big tech firms like Facebook, Google and Amazon. As consumers become increasingly aware of the extent Facebook (and other major tech companies) harvest and use their data, there has been a growing unease among users. And the latest scandal appears to be a tipping point for the social media company which is desperately trying to reassure the public as well as government regulators about its practices. In the wake of the Cambridge Analytica revelations, #DeleteFacebook began trending on Twitter as users vowed to leave the social media network behind. This morning TechCrunch published a scathing article with the same hashtag as its title. "Facebook is using us. It is actively giving away our information. It is creating an echo chamber in the name of connection. It surfaces the divisive and destroys the real reason we began using social media in the first place - human connection," the article said. The company's share price has fallen on the heightened anti-Facebook sentiment dropping nearly 7 per cent in trading on Monday in the US. 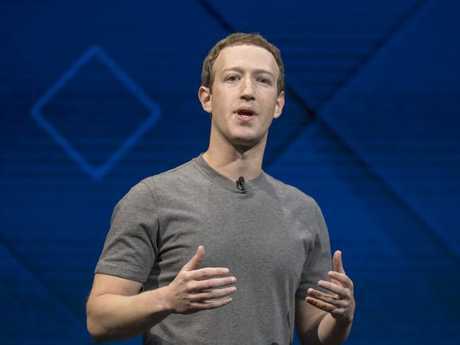 The 6.8 per cent drop lopped nearly $US40 billion ($51 billion) off Facebook's market value, and according to CNBC, personally costing its founder and CEO nearly $8 billion ($10.3 billion) in value. Meanwhile, at least one tech investor is calling for Facebook's COO Sheryl Sandberg to take over from the 33-year-old Zuckerberg at the helm of the company. 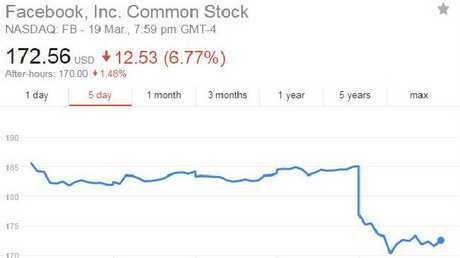 This is just a blip in the company’s meteoric share price rise since going public. Politicians in the US, Britain and Europe have called for investigations into the Cambridge Analytica revelations. Meanwhile, Australian authorities have also signalled they might investigate if data analytics companies used harvested Facebook data illegally to affect elections as part of the ACCC's review into Facebook and Google's use of consumer data. Since the latest drama, both Australian parties have worked to distance themselves from the British data firm despite the fact that a group of Liberal Party politicians met with an executive from Cambridge Analytica in early 2017. The latest bit of scrutiny presents a fresh threat to Facebook's reputation, which is already under attack in the United States over Russia's alleged use of Facebook tools to sway voters with divisive and false news posts before and after the 2016 US presidential election. "The lid is being opened on the black box of Facebook's data practices, and the picture is not pretty," said Frank Pasquale, a University of Maryland law professor who has written about Silicon Valley's use of data. Facebook said overnight that it had hired digital forensics firm Stroz Friedberg to carry out a comprehensive audit of Cambridge Analytica, which had agreed to comply and give the forensics firm complete access to their servers and systems. Cambridge Analytica said it strongly denies the media claims, and that it deleted all Facebook data it obtained from a third-party app in 2014 after learning the information did not adhere to data protection rules.